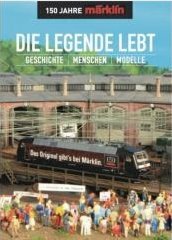 In commemoration of Märklin’s 150th anniversary, a special, limited edition book filled with information about Märklin’s history and influence on the hobby of model railroading will be available in November. 240 Pages. Please note: German text only. Prototype: Commuter “Push-Pull” train set of the German Railway (DB) Consists of passenger train locomotive Class 23, passenger coach type ABnb 703 “Silberling” 1st and 2nd class, passenger coach type Bnb 720 “Silberling” 2nd class and passenger coach control car type BDnf 738 with baggage compartment. Model: There is an electrical connection between the cars. The power pickup, the headlights and the marker lights change over with the direction of travel between the locomotive and the cab control car. The headlights and marker lights for the train that change over with the direction of travel and the smoke generator that can be installed in the locomotive will work in conventional operation and can be controlled digitally. The locomotive has an mfx digital decoder and a sound generator. It also has controlled Softdrive Sine high-efficiency propulsion and a maintenance-free, compact design motor. 3 axles powered. Traction tires. The locomotive and the tender are constructed mostly of metal. There is a close coupling with a guide mechanism between the locomotive and the tender. A 7226 smoke generator can be installed in the locomotive. The pickup shoe changeover can be deactivated in digital operation when the locomotive is running by itself and the normal headlight changeover can be activated. Only the pickup shoe changeover can be deactivated in conventional operation when the locomotive is running by itself. The headlights are warm white LEDs. The locomotive and tender have close couplers in NEM coupler pockets with guide mechanisms. Brake hoses and protection sleeves for the piston rods are included as detail parts. The "Silberlinge" / "Silver Coins" commuter cars have lightweight Minden-Deutz design trucks with double brake shoes. The cab control car has 3 warm white LEDs for headlights and 2 red LEDs for marker lights that change over with the direction of travel. The 73400/73401 interior lighting kit (2 each per car) can be installed in all of the cars. Total length over the buffers 109.4 cm / 43-1/16". Prototype: Class 234 Heavy Diesel Locomotive “Ludmilla” of the German Railroad, Inc. (DB AG). Execution in turquoise paint scheme. Model: The locomotive is constructed of metal. It has a digital decoder and a special can motor with a flywheel. 4 axles powered. 2 traction tires. The triple headlights change over with the direction of travel, will work in conventional operation and can be controlled digitally. Maintenance-free LED's are used for the headlights. The acceleration and braking delay can be controlled digitally with a 6021 Control Unit or Märklin Systems. Length over the buffers 23.9 cm / 9-7/16". Digital decoder built in; powerful four-axle propulsion. The reunification of Germany and the unification of the German State Railway and German Railroad, Inc. (DB AG) also brought about the re-painting of the former DR equipment. The "Ludmilla" with road number 234 304-4 is of particular note as it did not receive the characteristic red paint scheme, but instead was painted in the "mint turquoise" scheme shown here -- a situation with which proponents of the typical red scheme still take issue. Whether you prefer it in red or mint turquoise, the 234 304-4 is unquestionably more noticeable. (horns, whistle, air compressor, station announcements, etc.). Prototype: Belgian State Railways (SNCB/NMBS) class 59. Later version of the original class 201 with double lamps. B-B wheel arrangement. Version in yellow-green paint scheme. The locomotive looks as it did the beginning / middle of the Eighties. Road number: 5933 "Merelbeke". Model: The locomotive comes with an mfx decoder, controlled high-efficiency propulsion, and a sound generator. 2 axles powered. Traction tires. The headlights are maintenance-free, warm white LEDs. The headlights will work in conventional operation and can be controlled digitally. The overhang on the locomotive is different in length as on the prototype. The locomotive has separately applied handrails and air intake grills. Length over the buffers 18.6 cm / 7-5/16". Prototype: Heavy Diesel locomotive class ML 2200 ‘C’C. Test vehicle for the manufacturer “Krauss-Maffei” in the company’s original blue livery. As seen in operation circa 1957. Model: The locomotive has an mfx digital decoder, controlled Softdrive Sine high-efficiency propulsion, and a sound generator. The locomotive has a compact design, powerful motor. 4 axles powered through cardan shafts from the centrally mounted motor. Traction tires. The triple headlights and dual red marker lights will work in conventional operation and can be controlled digitally. The headlights are maintenance-free, warm white LEDs and the marker lights are LEDs. The locomotive has metal grab irons on the sides and ends. The locomotive has detailed buffer beams with separately applied brake hoses. The couplers can be replaced with end skirting and imitation prototype couplers. Length over the buffers 23.3 cm / 9-3/16". Prototype: Class Rs 684 of the German Railroad, Inc. (DB AG). European standard design with length of 19.90 meters. Design with stakes, round bumpers and without parking brake. Model: Bogies of welded type Y 25. Metal insert to insure good running properties. Removable stakes. Special under-body detailing. Many additional details. Reproduction load of concrete sleepers. Length over buffers 22.9 cm (9"). Prototype: Type Kklm 505 low side car. Fictitious design for the Christmas season. 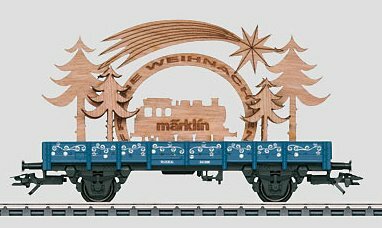 Model: The low side car comes loaded with a Christmas scene made of laser-cut wood in an attractive gift package. The car has close couplers with a guide mechanism. Length over the buffers 11.5 cm / 4-1/2". DC wheel set 2 x 700580. Prototype: 2 Heavy Truck carrying flat cars Type Rimmps 651 of the German Railroad, Inc. (DB AG). Both cars with MAN LKW 7 ton truck loads: one with flat bed, and one without. Vehicles in “THW” color scheme. Model: Car frames and flat bed constructed of metal. Cars have different road numbers. MAN LKW trucks each have 3-axles. Additional plastic details. Characteristic vehicles have authentic replication of THW paint scheme. Vehicle lengths approximately 9.9 cm (almost 4"). Each car / vehicle combination packed separately. Length over buffers (for both cars) 24.8 cm (9-1316"). Prototype: Refrigerator car with a brakeman's cab, older design.. This Christmas car comes in a clear plastic Santa Claus figure. The latter can be hung on a Christmas tree continues the series of festive themes from previous years. Model: Locomotive with 5-pole motor. All axels powered. Direction-dependent lights (3 white in front; 2 red in rear) change over with direction of travel. Maintenance-free bright LEDs. Prototype: One 4-axle depressed flat car type Sdgkms 707 and 2 additional 4-axle flat cars type Sgns 691 of the German Railroad, Inc. (DB AG). Loaded with one trailer load with truck change superstructure and four LKW flat-bed containers for the shipping company “Winner Spedition”. Model: Era V. Depressed flat car: framework and load support made of metal. Special bogies in low-profile design. Many details. Adjustable load mounting plates Flat cars: Type Y 25. Model and support floor made of metal. Each car is loaded with two LKW change plank beds, separately attached. Cars come with NEM coupler pockets and Märklin close couplers. Cars and loads with different road numbers. Length over buffers for entire set: 643mm (25-5/16”). Prototype: Flat cars of type Sdgkms 707 of the German Railroad, Inc. (DB AG). Designed for transport of containers. Model: Cars with metal chassis and close couplers. Cars come loaded with containers for the company “DHL”. All cars and containers with different road numbers. Length over buffers for each car: 102mm (4”).